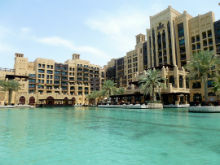 The Madinat Jumeirah Resort is a spectacular resort location which features three hotels, Mina A' Salaam (Harbour of Peace), Al Qasr (The Palace) Hotel and Dar Al Masjaf with rooms arranged like courtyard houses. 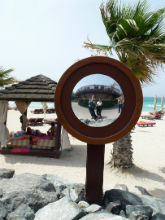 We spent some time wandering around the Madinat Jumeirah Souk. 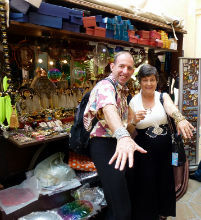 I found some bracelets and a small jeweled camel to buy for my grand-daughter. 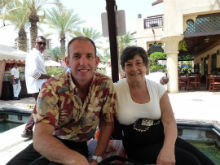 The Abra (water taxi) tours through the waterways of Madinat Jumeirah are 20 minute rides that leave every 20 minutes from the Souk Abra stations near the restaurants of Toscana and Barzar. It was scorchingly hot which gave us a great excuse to indulge in some ice-cream from the local vendor. Then we decided to do the Abra waterway tour. As you can see the views were quite beautiful as we cruised around the resort area. In these pictures we are waiting for the abra to take on a couple more passengers. Check out the abra waterway link for a very short video clip of the boat and the local turtle conservation area. I am having fun with IMovie! We passed by the major hotel areas and the luxury villas. The old building styles , lacking today's air conditioning systems, incorporated wind towers on the roofs to funnel cool air into the rooms below. 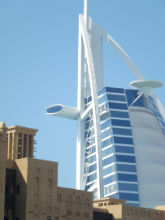 The view of the luxury hotel, Burj Al Arab is very interesting.The tube like structure on the left that protrudes from the building contains a restaurant. I would love to eat up there. It must be quite an amazing view. The other rounded protruding structure is a helicopter pad. I guess when I can afford the helicopter to fly me up to the hotel landing pad i will be able stay in the hotel and dine at the restaurant. But not just yet. I will have to stop splurging on dance cruises, and right now dance takes priority over luxury hotels. We also took a walk down to the beach and out along the pier that extends quite a distance into the water. Then we strolled along the path in the direction of the Burj Al Arab for a closer view. 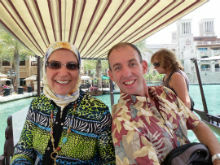 After lunch we decided to head to the older part of the city to visit the Gold and Spice Souks and drive by the original port area. On the way to visit the Gold and Spice Souks, we encountered a sort of sand storm. Nothing like the total "white outs" one hears about in adventure stories - or Tom Cruise movies - it nevertheless added a grey haziness to the view. Transportation in Dubai has some interesting features. For example they have a Pink Taxi system. Pink taxis have female drivers and take only female passengers. Dubai has quite an extensive Light Rail Transport system - now known as the Dubai Metro. Opened in September 2009 with a monorail system out to Jumeirah Palm Island, the Metro has both above ground and underground components. The train stations look quite futuristic in design. 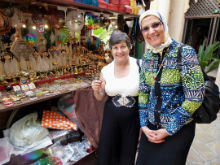 We spent some time wandering the covered market area in both the Gold Souk and the Spice Souk. 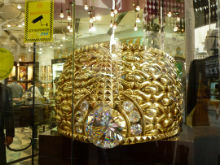 We saw the world's heaviest gold ring, the Najmat Taiba (Star of Taiba) in the window of one of the stores. It has 5.37 kg of precious stones mounted on a 58.686 kg 21 carat gold ring. It is a bit too much "bling" for me. I loved the various scents of the store fronts we walked by in the Spice Souk, but was not tempted to bring anything back. 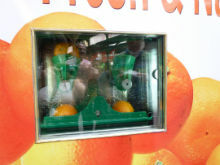 Ironically the thing that fascinated me more than the gold and spices, was an automatic fresh orange juice vending machine that sliced fresh oranges and squeezed out the juice. We all ended up having some and it was delightfully refreshing. Check out another brief video clip at The Juicer. Yeah I know it is cheesy but I am learning to use IMovie and YouTube. The other thing that had caught my eye the previous day, and that I forgot to mention in the earlier post, was the Foursquare sign at the Atlantis. I was sorry I did not have my cell phone on me. 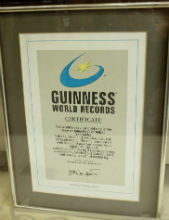 How cool that would have been, to check into Foursquare in Dubai. From the Spice Market we drove back to the Hyatt where we said goodbye to Robert.